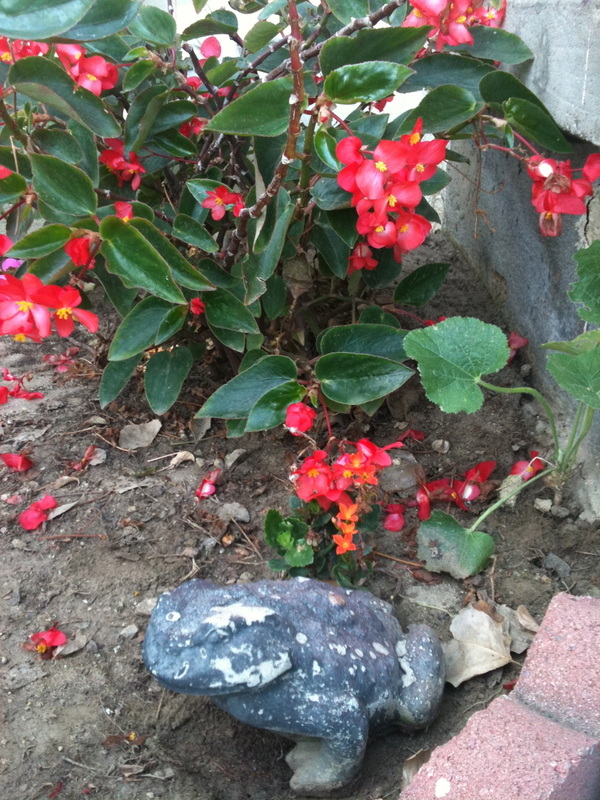 Any plant that can survive in my garden must be easy to grow. 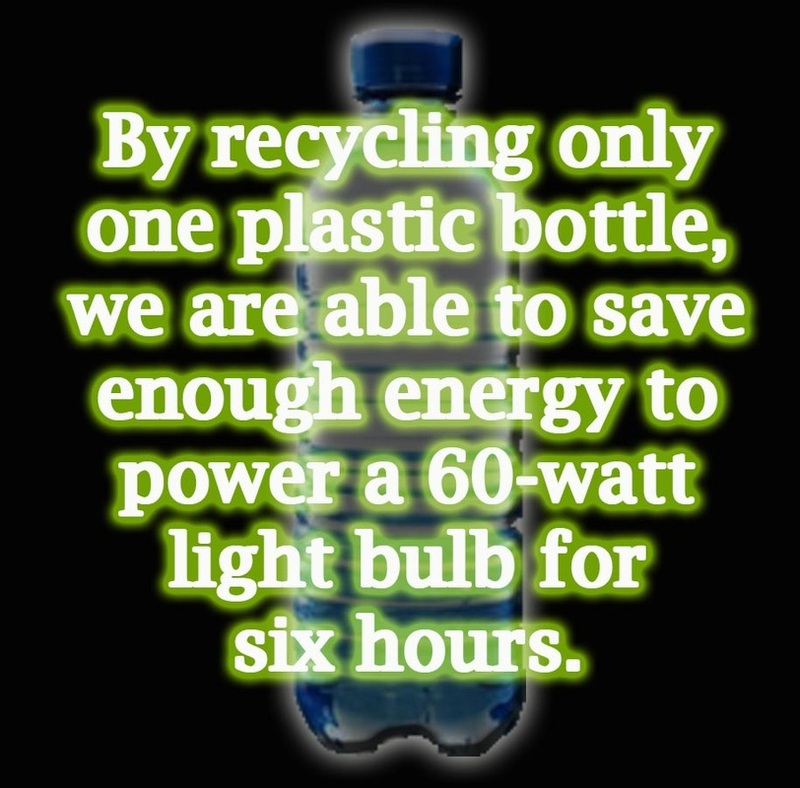 Find recipes and tips here. You can sit on the swing and enjoy a rainbow of colors as you watch the sunset. Was weeds. 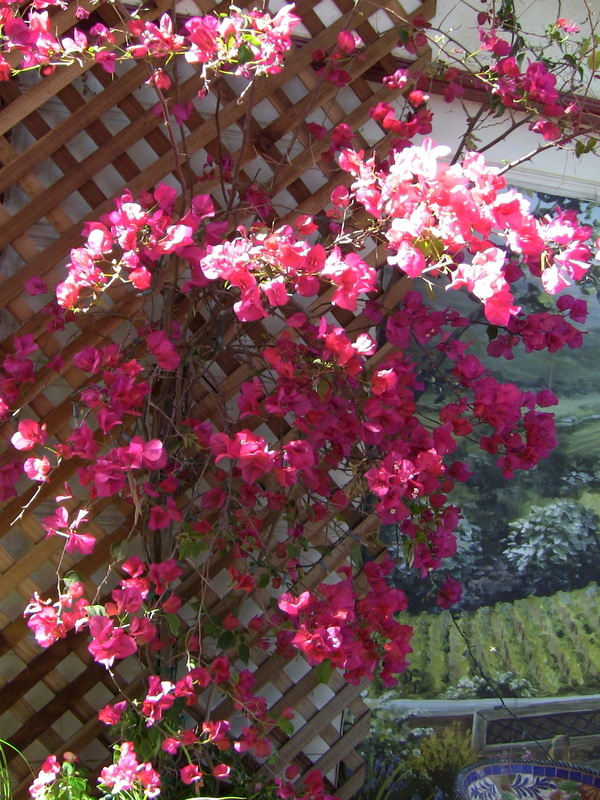 Now filled with color from bougainvilleas and lilies. Adds curb appeal driving up to the house. Many colors of lilies. Match to house paint. 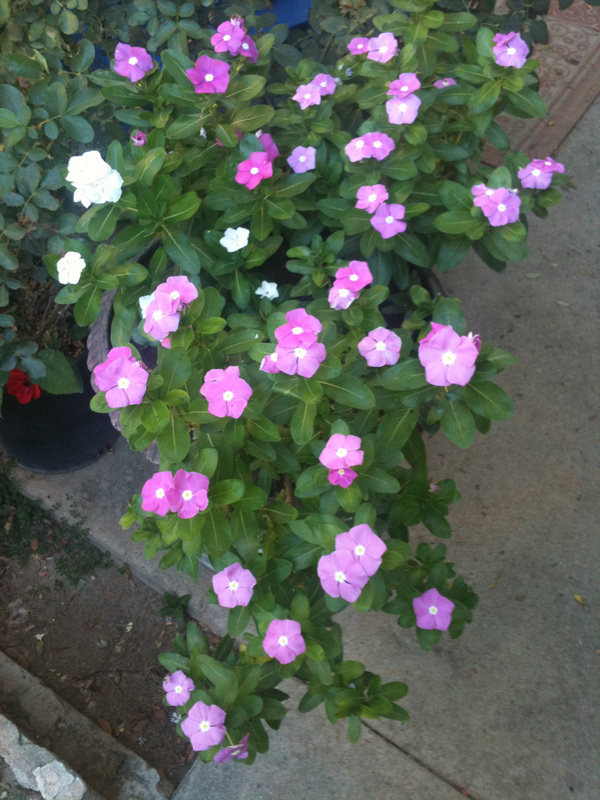 This vinca gets more beautiful each year. Just trim back in the winter, and full in spring. 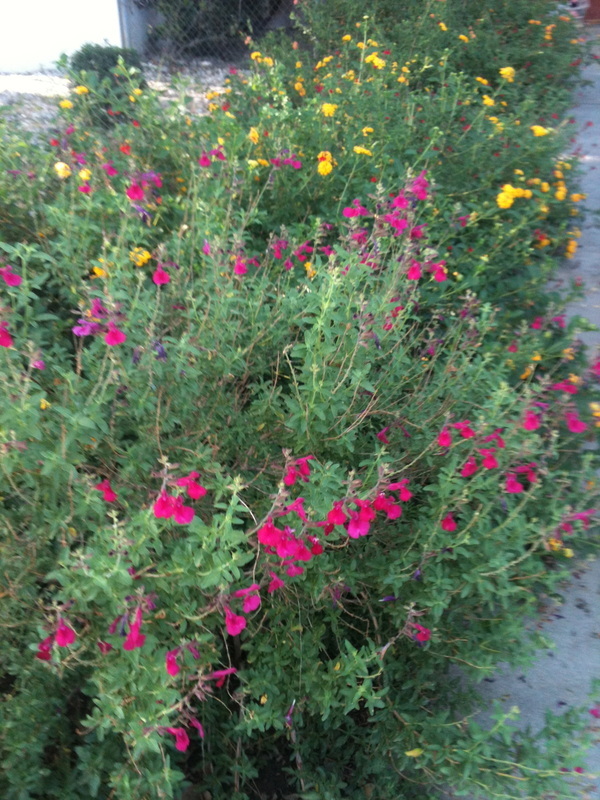 Low cost, big color, easy to grow. The plant on the left took some work to design. As it has grown, just kept weaving branches. Has beautiful lavender flowers. Here is another view. 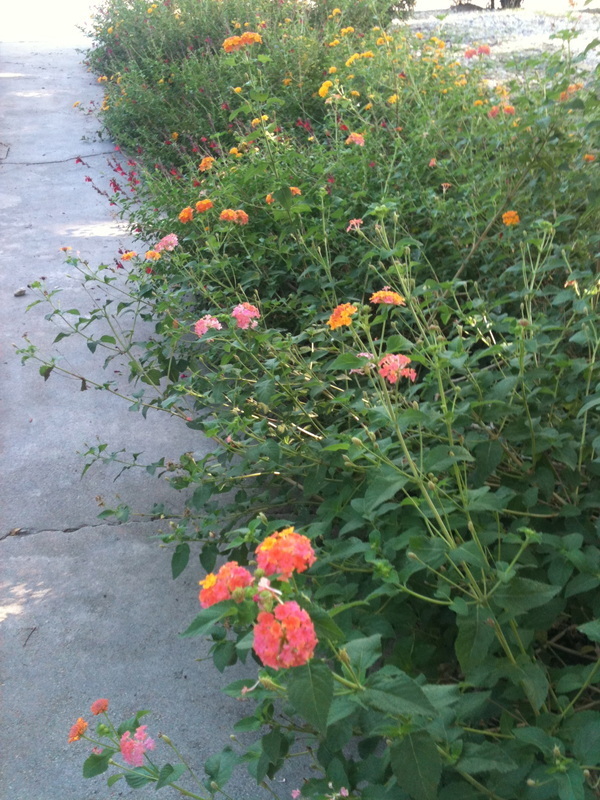 Now when pulling into the driveway a burst of color is what you see. 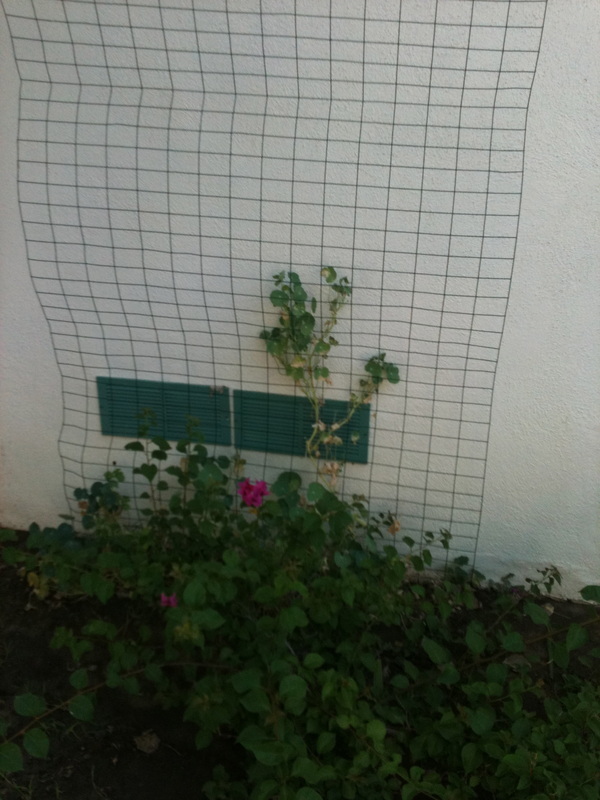 Close up of a bougainvillea and lattice. You can't see them, but there are clear string lights for at night strung also. 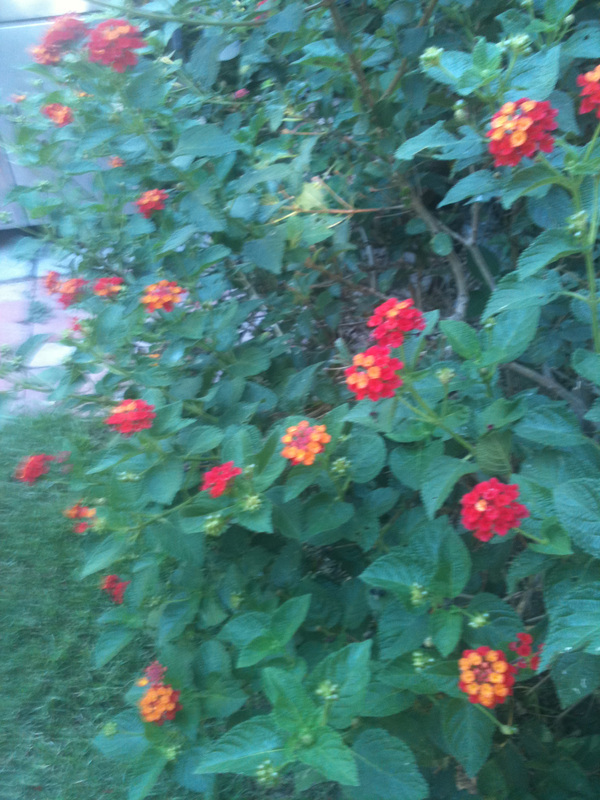 Lantanas give you continuous flowers and the hummingbirds and butterflies love them. 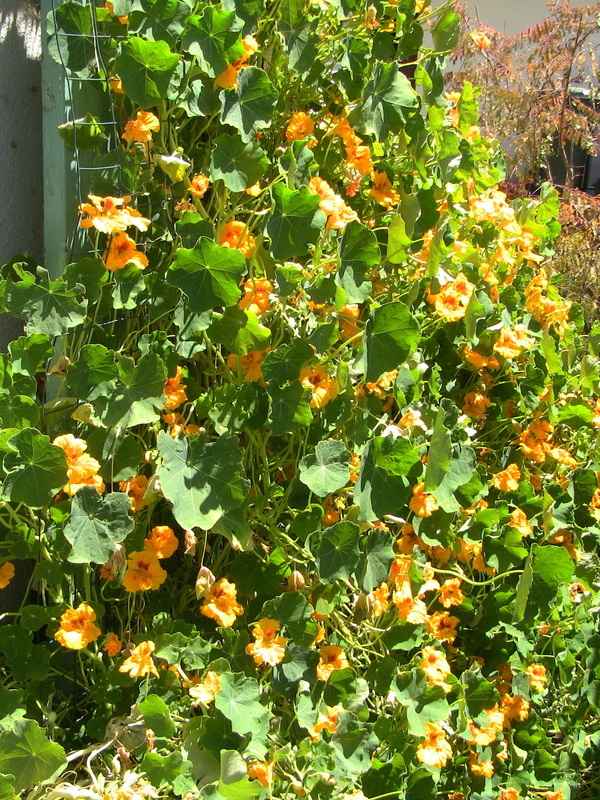 Nasturtiums not only create a colorful wall of blooms, but are edible. 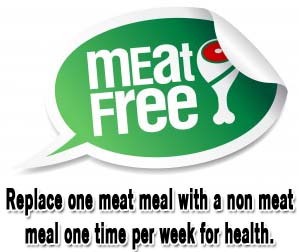 Add to salads or plates as a garnish. Low cal, crunchy, radish taste, beautiful color. 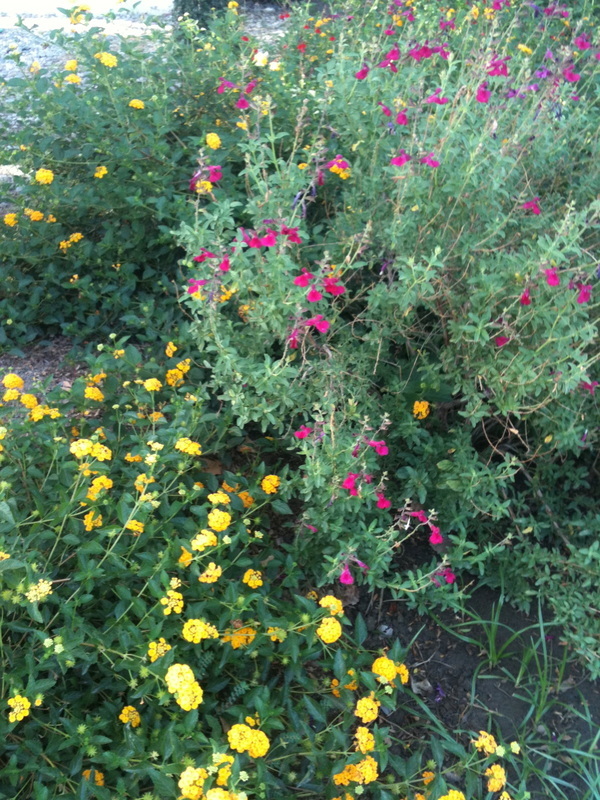 This plant blooms color the whole year. Will live in shade when others die. That frog is one of my favorites. 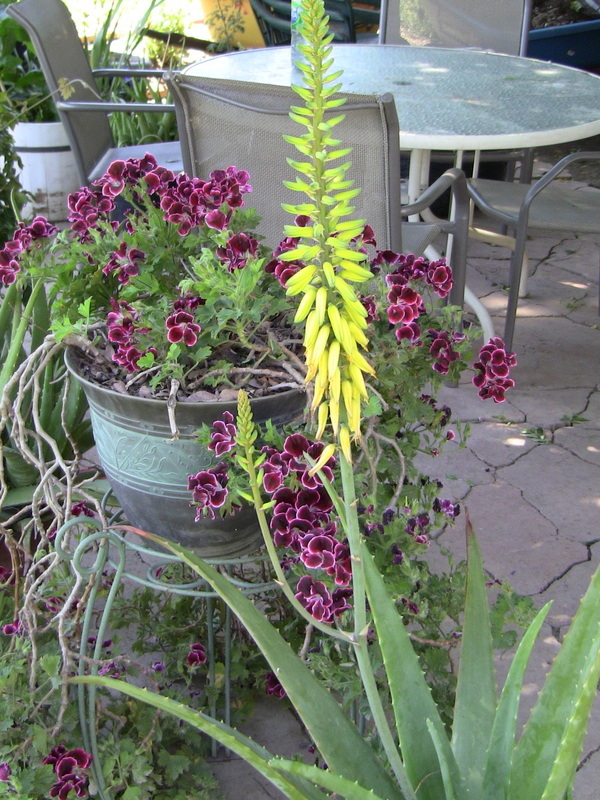 The gel found in aloe vera plants provide healing for skin cuts, burns, and bites, but also display a magnificent bloom. 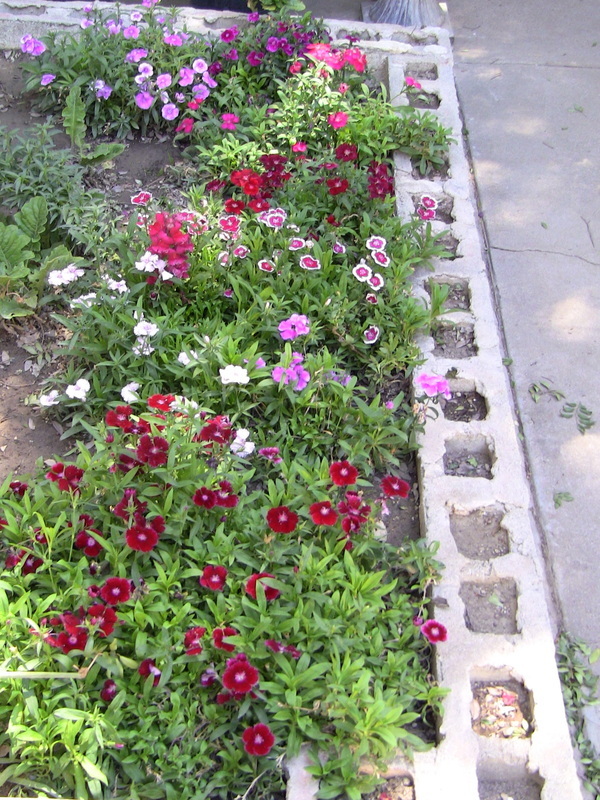 Bachelor buttons are great as they will last for years, and give you continuous color. 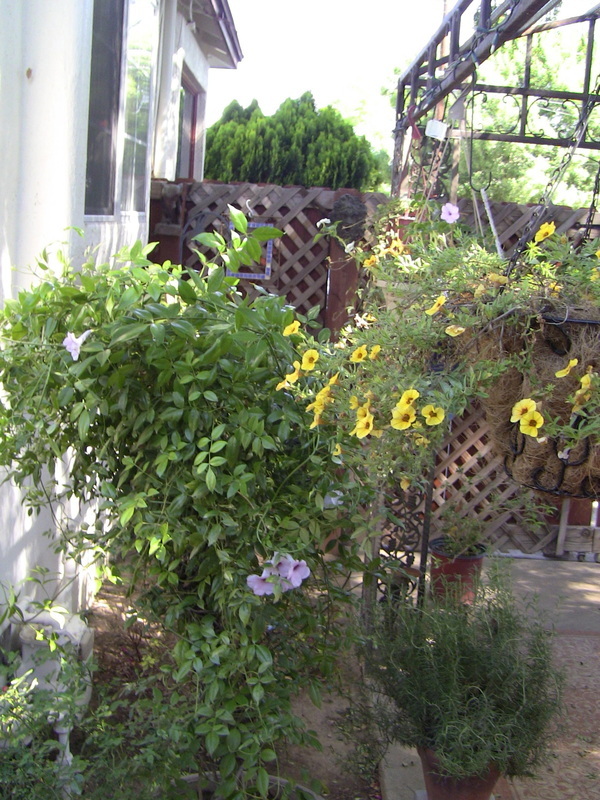 Watch butterflies and hummingbirds visit these flowers from my kitchen through double pane glass Anderson back door. 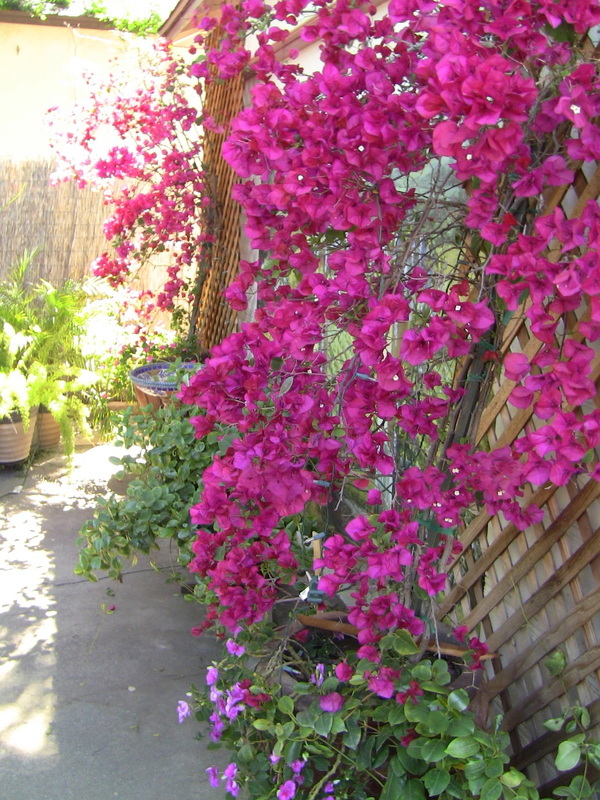 Here my bougainvilleas were all gorgeous with pink blooms. Does well in the pot. Lattice made from roll of strong green wire. Hung from eaves with hooks. When Nasturtiums make it through summer are awesome in spring. Drought resistent shrubs down the side of my driveway only needs a little trimming and water. Delivers big on color. 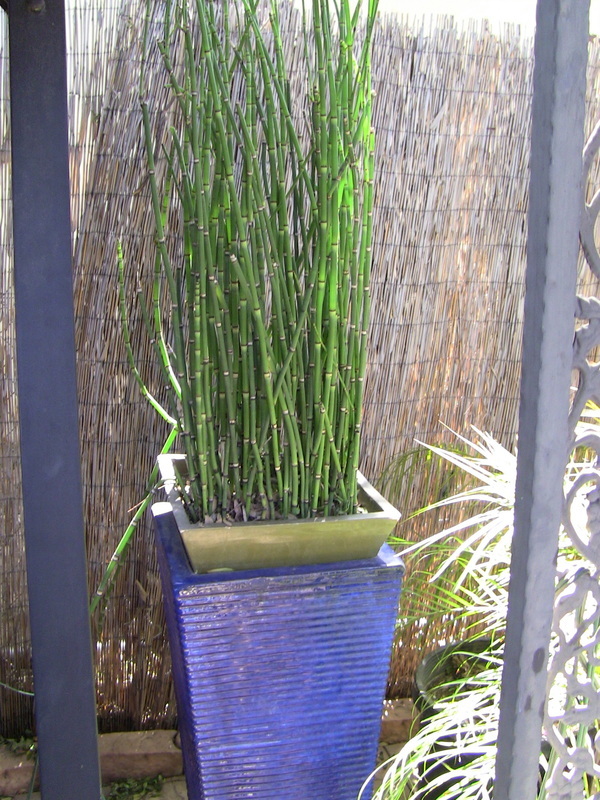 Always liked the look of this bamboo. Choose a vase to plant if you don't want them to take over the area planted. 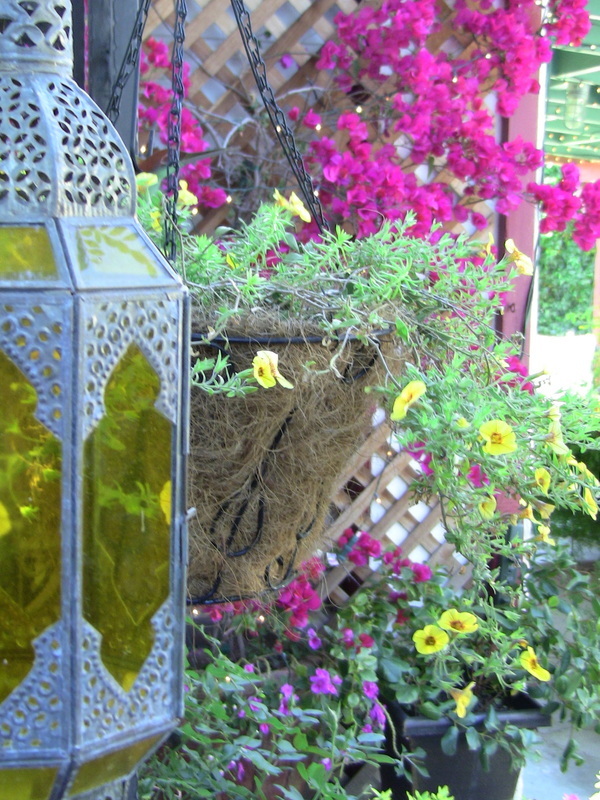 My special place where I listen to my fountain while swinging under my wrought iron gazebo. 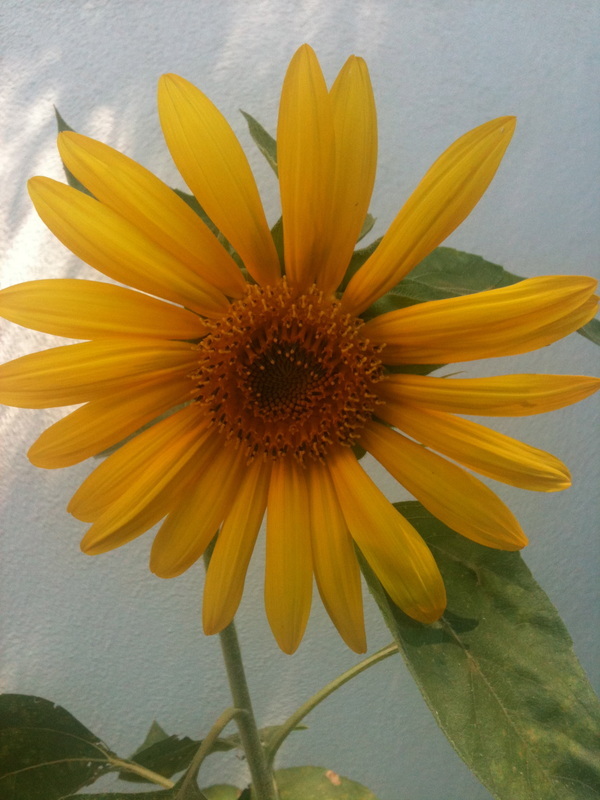 Sunflowers need lots of sun to grow big. Had in full sun last year and they were much bigger, but you love them big or small. 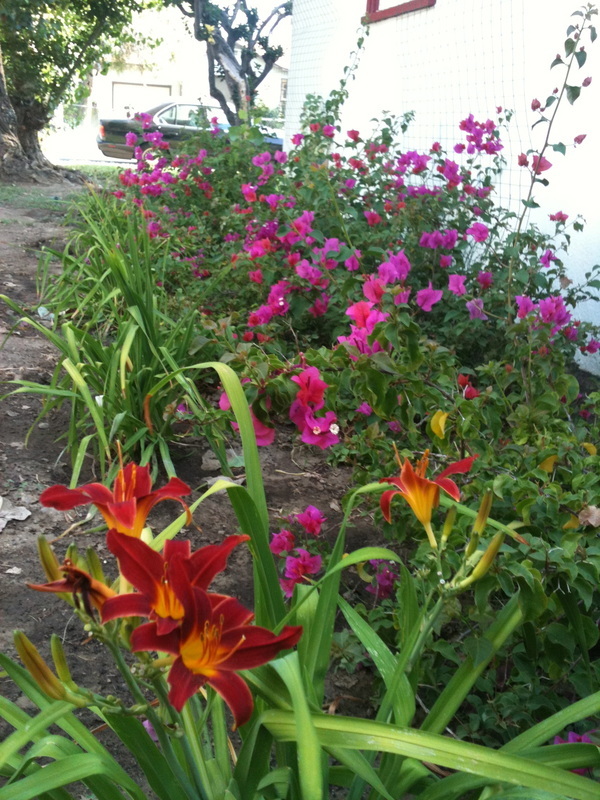 Have Instant Access to 100s of Gardening Articles. 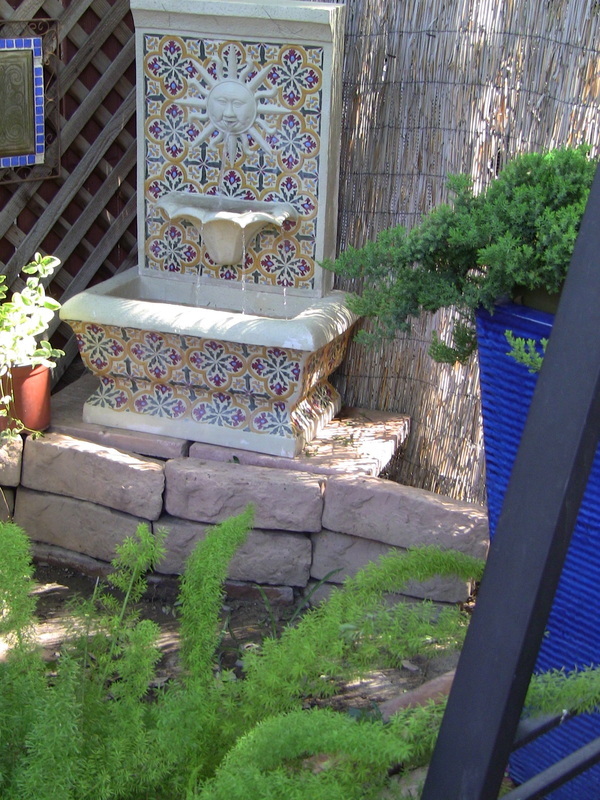 Visit our Pinterest Gardening Board and find a wide variety of information on gardening that can help you save time and money. You don't need experience just a desire to grow something. 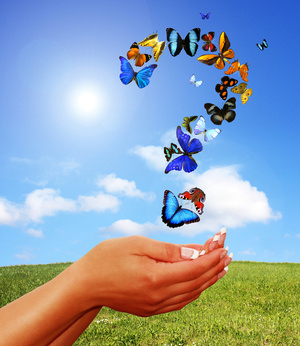 Our board has a collection of pictures for you that link to articles from all kinds of writers to answer your questions, provide short cuts, what to do or not do in different climates, how to grow organic, alternative pesticides and pest information, gardening in small spaces, pots, or indoors, how to build a raised bed, aquaponics, and much more. Kind of like all your favorite magazine articles in one place without the mess. 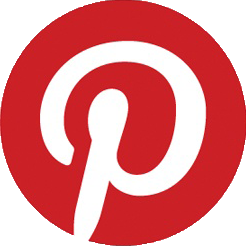 Follow Elaine McFadden's board Gardening on Pinterest.